Chip Noble ’97 and his daughters, Abby and Emma, are waiting for us outside Garmin International’s office in Yarmouth, Maine. Inside, the world’s largest globe spins slowly behind floor-to-ceiling windows. 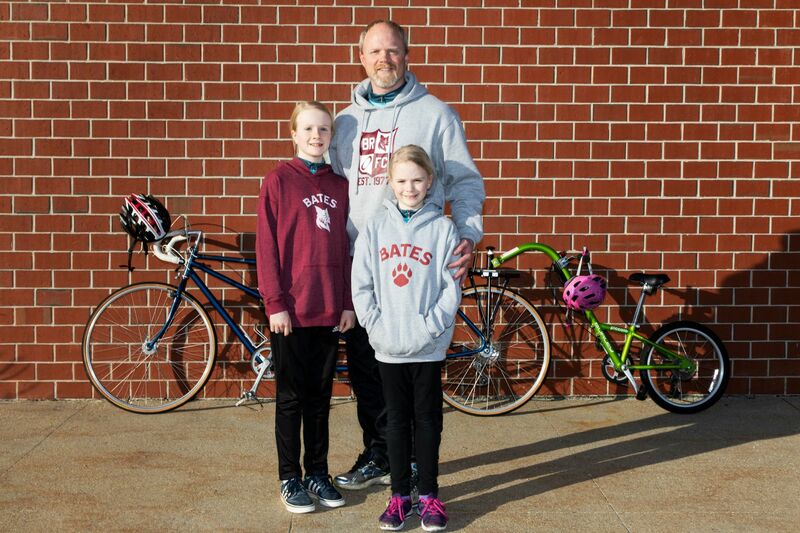 They’ve brought everything they need for our photo shoot: their bike helmets, both Garmin jerseys and Bates sweatshirts, and a three-person bike that, during three days in June, will take the family on the Trek Across Maine, the 180-mile bike ride that benefits the American Lung Association. A senior product manager at Garmin, Noble is both a Trek veteran and a central figure in its organization. He leads the creation of detailed maps for the Trek, which has raised $24 million for lung health since its inception 35 years ago. Learn more about Trek Across Maine, register, or support a cyclist at TrekAcrossMaine.org. This year’s Trek is a bit different, and particularly special for Noble. 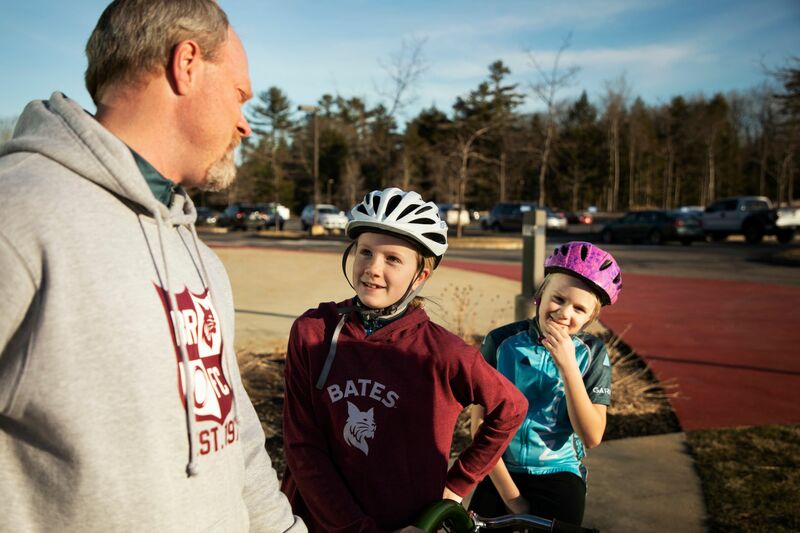 For one, the Trek’s course shifted from its traditional mountains-to-sea route to a central Maine loop that begins and ends in Brunswick, reaches as far north as Waterville, and has a stop at Bates. For another, the Garmin technology available to riders, developed by Noble’s team at the Yarmouth office, has been upgraded and includes a device that can send an SOS signal and keep supporters updated with the rider’s location. 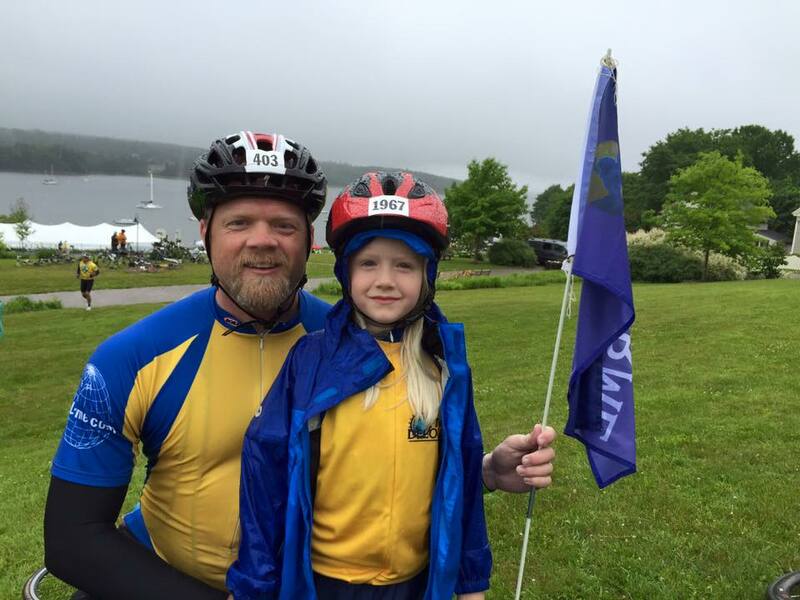 But most important to Noble, Emma has hit the Trek’s minimum age of 7, which means that dad and daughters can all ride the Trek together. “It’s a really emotional thing for me to have my own daughters participating and understanding that it’s a fundraiser for lung health,” Noble tells me. 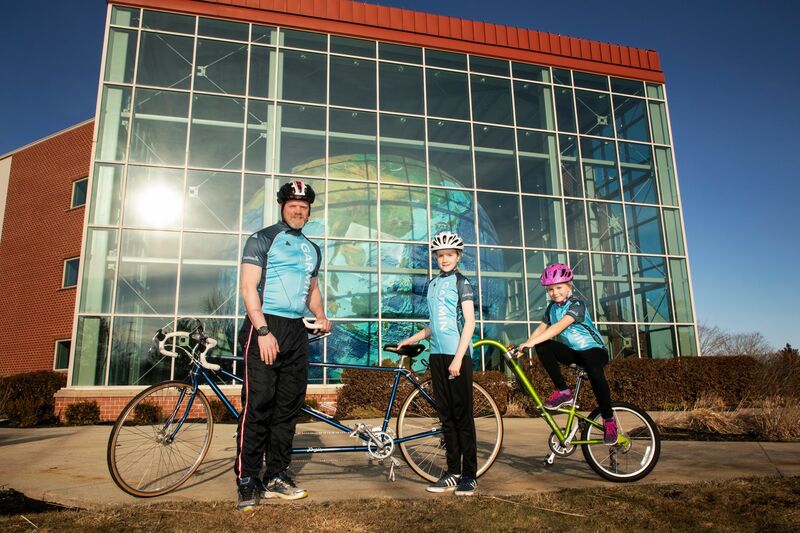 They’ll ride on a tandem bike with a child’s trailer attached, which, during the photo session, Noble is trying to maneuver away from Garmin’s brick wall and in front of Eartha, the globe. The rig has a long turn radius. “Wait till we’re actually trying to get around the state on this thing,” he says. They haven’t tried to ride the bike yet. Emma and 10-year-old Abby are energetic, excited to be outside after a school day and ukulele practice, and eager to talk about the Trek. For Abby, who’s ridden twice on the trailer, which they call the tag-along, the excursion is old hat. Noble himself has been involved with the Trek since 2005. Back then he worked for DeLorme, Maine’s well-known mapping and navigation technology firm, which Garmin bought in 2016. The lung-health mission of the Trek resonated with Noble, whose father had respiratory issues stemming from polio. And when the map-making task came to him, he decided to organize a company Trek team. “The best way to understand the event and the maps that I’m making is to actually go ride the Trek,” he says. Noble, who ran track and played rugby at Bates, was hooked. For the first few years, he says, the Trek was a personal physical challenge. Soon, however, it became a family tradition among Chip, his wife Amy, and the girls — Amy has ridden the Trek in the past; now she’s in charge of Team Garmin’s support vehicle. Abby and Emma have been observers, volunteers, or riders each year since they were born, and they’re front and center in the Garmin team’s fundraising campaign. 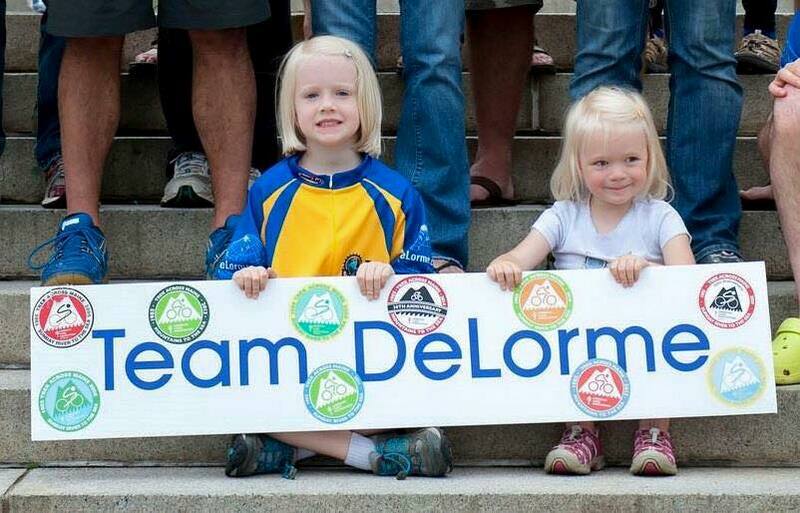 In 2014, Abby and Emma Noble were the literal poster children for Trek team of DeLorme, which was bought by Garmin in 2016. (Courtesy of Chip Noble). Abby has ridden the Trek twice now, offsetting the hard work of a two-person ride through sheer motivation. During a rest stop on one Trek, Chip and Abby realized that a support vehicle that stayed at the back of the pack was approaching. In the next few weeks, they will start training in earnest, increasing up to a day’s ride. Abby and Emma are particularly excited about one training ride, which involves staying in a hotel with a pool. After the photo shoot and our goodbyes, the Noble family takes the bike to the end of the parking lot, to try it out in a secluded place. They start making big loops on the asphalt. Once they figure out how to pedal together, they look good to go.